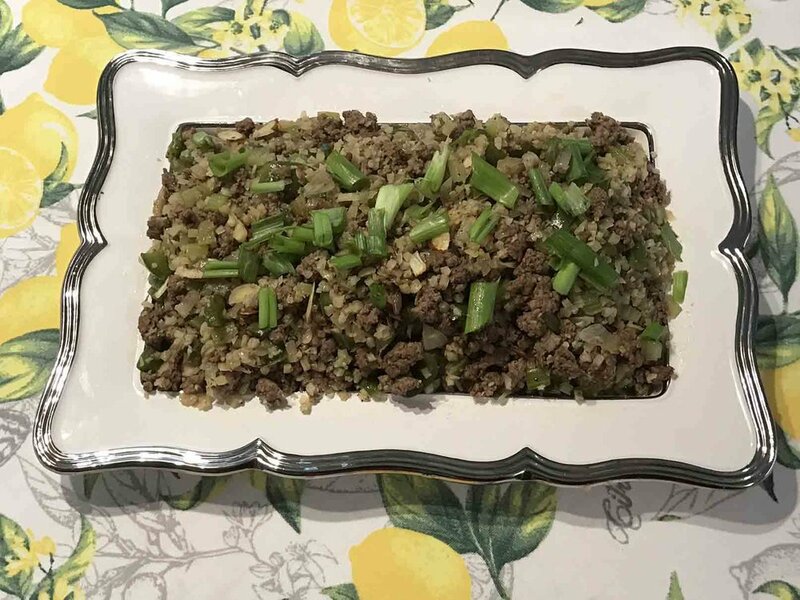 For those of you who have been doing Keto for a long time, I am sure you have come across the recipe (and its many versions) called "Crack Slaw," which is nothing more than ground beef mixed with cabbage and a few other items. It is so wildly popular you would think that it is difficult to make. Not so. The other night I made something similar with ground beef but with riced cauliflower, so I am hijacking the name and calling it: Caulicrack. If you are strictly adhering to 20 Total carbs, this is rather hefty — and to tell you the truth, I only made the "Crackslaw" once when I was eating that way. But as I moved over to a net/total carb system, it became more a part of my meal rotation and this Caulicrack also fits in. Melt coconut oil and add onions, peppers and celery. Sauté at medium to low temperature for about 15–20 minutes until the vegetables start to soften. Crumble up the beef and add to the vegetables and continue sautéing until beef is no longer pink. Add riced cauliflower (I used a 12-ounce package, frozen, from Trader Joe's but you can rice your own medium-sized fresh cauliflower, but steam it to soften it after ricing). Continue cooking about another 10–15 minutes. Add salt and pepper to your taste. Put on a serving platter and top with green onions (scallions). Top, if you like, with ¼ cup slivered almonds. I make it into five servings – approximately one cup each. If you serve it on a plate of salad greens, dividing it into six portions even works! It also makes a great lettuce wrap — a very filling lunch or dinner. Disclaimer: The information I share on this website or through coaching is based on my understanding of research and the nutritional coaching certification I hold. I am not a medical professional and “Granny Keto” is not a medical site. Any information I share, and any encouragement I give, is not to be considered medical advice or knowledge. In addition, links on this site may direct you to affiliate links, where I will receive a small amount of the purchase price of any items you buy through those links. Thanks! Copyright © 2019 by Granny Keto, LLC. All rights reserved.